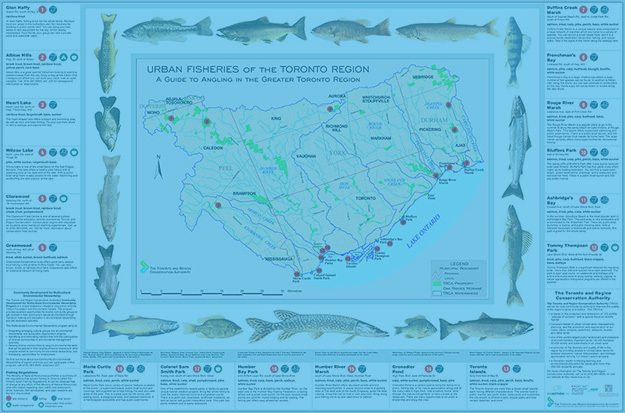 There are a wide variety of fish species found in and around Tommy Thompson Park. You will find many species of recreational or sport fish, including largemouth bass, yellow perch and lake trout. Small prey or forage fish such as minnow and shiner species, as well as alewife and rainbow smelt, provide an abundant food source for a range of wildlife that forage and hunt in and around the park. The fish community of TTP fulfills many ecological, cultural and economic roles. There are many recreational fishing opportunities at Tommy Thompson Park. Aquatic habitat enhancements have improved conditions for coolwater fish in the Embayments, including successful Northern pike spawning channels. Habitat enhancements scheduled for Embayment D will improve warmwater fish habitat, as they have in the Cell One Wetland. Coldwater fish habitat is provided in East Cove; however habitat enhancements for this area are not scheduled in the immediate future. While Cells Two and Three have mixed fish communities, aquatic habitat enhancements have yet to be undertaken and fishing is only available from shore, as the waters are not considered navigable. Provincial licences are required to fish at Tommy Thompson Park. For information on fishing licences and regulations please visit the Ministry of Natural Resources and Forestry. Toronto and Region Conservation (TRCA) has adopted a NO LIVE BAIT policy at all of our conservation areas to help control invasive species and native species not present in certain waterbodies. Only worms or artificial lures are allowed. For more information on eating the fish you catch please consult the Province’s guide to Eating Ontario Fish. All fish are prey early in their life. Some species, however , remain prey for their entire lives. Forage fish play a critical role in aquatic ecosystems; they make an important contribution to biodiversity; and they provide a link in the food web for energy transfer to higher trophic levels. Forage fish populations are also an important indicator of the overall health of the aquatic ecosystem. In fact, the majority of the fish population in the Great Lakes consists of forage fish. Forage fish at Tommy Thompson Park will benefit from overall aquatic habitat enhancements, and certain species will benefit directly from habitat enhancements targeted at other species. Invasive species can wreak havoc on aquatic ecosystems, with far-reaching impacts on everything from tourism to public health. Invasive species may alter their environment by changing water quality and quantity, disrupting complex food webs, and spreading disease. The introduction of these non-native species can lead directly to a loss of biodiversity — and even the extinction of native species extinction. The number of introduced species in Lake Ontario continues to grow — a result of illegal releases, improper boat cleaning, and the discharge of “dirty” bilge water by ships traversing the lake. In 2015, the Toronto and Region Conservation environmental monitoring team found five invasive grass carp (Ctenopharyngodon idella) at TTP. TRCA has since launched a proactive surveillance program for Asian Carp. Discovery of grass carp at Tommy Thompson Park in July 2015. Please do not use live bait or transfer any fish, regardless of their origin, to a different water body. Help us to keep our waters free of introduced and invasive species, so we can continue to provide the best possible fishing experience at TTP for years to come.